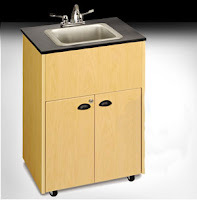 What options are available in cabinets for mobile sinks for indoor or outdoor use? There are several different options for mobile sinks, particularly when it comes to cabinets and tops. Indoor models may have cherry or maple or, if you want, the color of the cabinet can be customized to your specific requirements. Customized options can include virtually any color from a clinical white for a doctor's office through to a completely unique look top and cabinet designed to meet a very specific type of décor. Sink sizes and sink shapes are also a major difference in options offered with mobile sinks. Some companies only offer a standard basin while other companies offer a huge range of different options. This can include deep basins, double or triple basins or even the position of the faucet to the back or side of the sink. How does the water heating system work with mobile sinks? Will it add a lot to an electricity bill? Mobile units that are designed with the consumer in mind have been built to be very easy on the electrical bill. Both the hot water heating system and the pump only activate when the taps are moved from the off to the on position. In other words, they only are drawing electricity when they are being used. The pump will begin to move the water from the fresh water tank to the sink when the cold water tap is turned on. Turning the hot water on allows the pump to also send water to the on demand heater, providing the option to use both hot and cold water at the same time. Using a mobile sink will inevitably increase electricity consumption in your household, office, or classroom. However, when compared to the cost of plumbing, having a water heater running all the time or constantly having to move back and forth to a standard sink in the home or office it is really a time and money saver. Are mobile sinks a practical option for a mobile catering company that actually prepares food on site? Mobile sinks are a great option for mobile catering services, particularly those that catered events in areas without existing commercial kitchens or sources of running water and heated water. This can include halls, outdoor venues, parks and private homes. Having the ability to have immediate hot and cold running water helps with both food preparation and cooking. It also ensures that employees can follow all regulations with regards to hand washing during food preparation and handling. Having a portable sink on sight will add to your customer's satisfaction with your service. It shows that you care about the quality of your food, the safety of your food handling practices and the level of service you provide. Since you can have multiple fresh and waste water containers on hand you never have to worry about running out of water. In addition, with a quick connect attachment, the sink can easily be attached to a potable fresh water source you can refill fresh water containers almost anywhere with a potable water supply.